Hybrid discontinuous Galerkin methods provide a flexible approach to introduce discontinuities between sub-domains in a variationally consistent way. 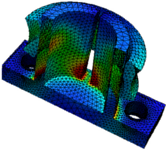 The goal of this project is the design of a new robust and flexible family of hybrid discontinuous and mixed Galerkin methods for a large class of complex problems in linear and non-linear solid mechanics. The arising hybrid formulation will be a generalisation of mixed elements like Raviat-Thomas and BDM and mortar elements on the skeleton. Geometrical and material non-linearities, as well as crack problems will be treated. To avoid locking phenomena and oscillations, multi-field formulations involving stresses, displacements and further variables as primary variables will be used. The designed methods will be implemented adaptively, combined with advanced finite element technology, analysed for inf-sup stability and benchmarked.